Roses have a big significance but not just for their beauty, their medicinal properties too. 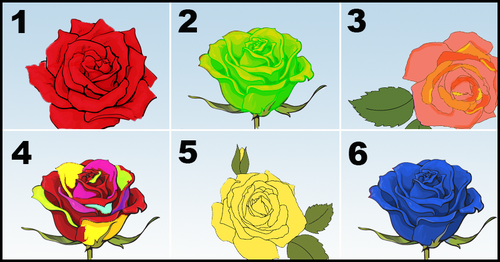 Look at this image and find the rose that you feel represents your personality the best, since each one of them has a unique significance and meaning. The one you pick has a lot to say about you and what you think- so read on and discover the beautiful secrets that the rose you picked reveals about you. The classic red rose is a bold choice which reflects an extroverted, brave, honest and sincere personality. It is because of your honesty that you know how to detect lies and have a very good intuition. The future is yours and you may have a lot of plans, but you know what you want and you’re not afraid of going after it. Going with so many goals, however, can get you all stressed out which is why you need to relax sometimes. Go for a walk and don’t forget to stop and smell the roses! Everyone knows you can be turned on to for support because you’re someone who loves taking care of others and protecting those around you especially your loved ones and friends. Your first concern is to ensure a healthy balance and harmony and peace in your life. However, you need to be careful because sometimes you can build a wall between yourself and the rest of the world, which is why, you may feel isolated. Learn to take risks and accept change when it comes around. You’re someone who runs by your emotions and can be sensitive. You sometimes feel you don’t fit in this world, but that’s because of your sensitivity. You often underestimate your achievements and relationships and don’t realize your own value and that you have so many hidden talents that need to be discovered. Try to believe in yourself a little bit more and surround yourself with people who love you and support you. You’re creative, happy and natural and that’s just a few of the amazing qualities that you possess. You’re an optimist at heart and love seeing things in a positive way. You’re curious and adventurous and love to discover new things and experience different things. You also enjoy starting new projects though you don’t always follow them and often abandon them as you get bored. You’re always looking towards the future and you crave alertness and security and are constantly striving to make the world a better place to live in. Just try not to be so focused on your future that you also forget to enjoy the present. Live your life just as you would in the day. There’s absolutely no doubt that your dreams become a reality since you are so disciplined, dedicated and believe in putting 110%. You’re one of those who work super hard and love what you do, which is why, you advance pretty quickly and are looking for new ways to develop and work. Make sure you maintain a healthy balance so that you also have people around you to share your success with.